The annual sojourn of Lord Jagannath, the reigning deity of the universe, one of the most eagerly awaited religio-socio-cultural events in the calendar of the country, the "Ratha Yatra" is going to take place here at Kolkata during 14th July to 23rd July, 2018. As before, UTKALA will present at the SWABHUMI, the annual cultural extravaganza "ODISHA FESTIVAL-2018", showing the rich heritage of art and culture of Orissa, in harmony with performing artists of international repute. Let us then join hands; not to fathom what mileage we get from this association, but to feel humbled & privileged to associate ourselves with this rich ancient culture, dipped in ethnicity yet having a national ethos. All this would not have been possible without YOU and your valued patronage. We shall remain ever grateful for your continued support. 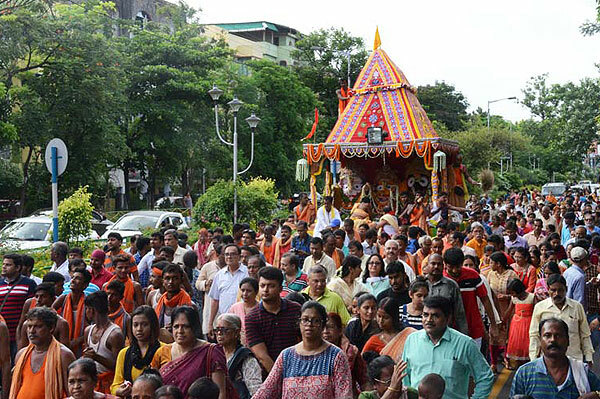 Ratha Yatra, the Festival of Chariots of Shri Jagannath is celebrated every year at Kidderpore, Kolkata, the temple town in West Bengal, on the second (dwitiya) day of Shukla Paksha (waxing cycle of moon) of Ashadh Maas (3rd month in Lunar Calendar). 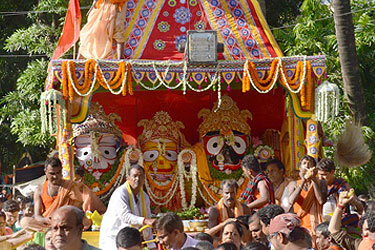 The presiding deities of the main temple, Lord Jagannath, Lord Balarama and Goddess Subhadra, with the celestial wheel Sudarshana chakra are taken out from the temple precincts in an elaborate ritual procession to their respective chariots. The huge, colourfully decorated chariots, are drawn by multitude of devotees. 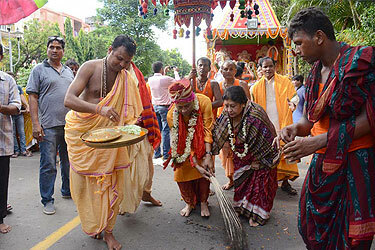 Kolkata Rath Yatra festival is the first festivity of the Monsoon season and usually falls in late June or early July. Rathyatra festival of Kolkata, India is dedicated to Jagannath, an avatar of Vishnu. It is on this day that processions where the idols of Jagannath's chariot sell like real hot cakes on this day. Children adorn their chariots with flowers. In the chariots, they keep the clay images of Jagannath, his brother Balaram and sister Subhadra. 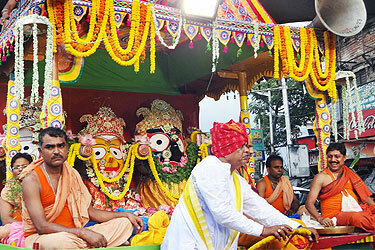 Rathayatra is celebrated to mark the beginning of harvest season. It is owing to this fact that it is considered a very auspicious time. This festivity is of prime importance in villages and towns. The vivid, colourful & vibrant exposition of traditional performing arts such as Animal Dance, Dancing Kirtan Mandalis & performing conch blowers from Orissa will lead the chariot of the Lords from the Sri Jagannath temple at Kidderpore to Central park at Salt Lake, After Chhera Pahara at Central park, again the chariot of the lords, the RATH, will be pulled by umpteen number of devotees with HARINAM on their lips, and led by the performing artists to Swabhumi, where the deities will be enthroned for the next 9 days. Our humble efforts to bring to the discerning audience of Kolkata, year after year, the ODISHA FESTIVAL has carved out its own place as a niche event in the socio-cultural calendar of this cultural capital of India.